He was first known from his racing career, having started at an early age of 11. This Filipino-Italian hunk got his first taste of fame when he won numerous awards including being a three-time winner of the Karter of the Year award. In 2010, Matteo Guidicelli got his first big break in the now defunct ABS-CBN primetime fantasy television series Agua Bendita. With a hit teleserye that just wrapped up, regular guestings at ASAP 18 and consistent workouts plus trainings, Matteo Guidicelli surely enjoys the perks of being a sought-after actor, a famous model and a competitive athlete but even with his hectic schedule he still finds time to bond with his family especially with his 5-year old brother, Gian Paolo. “My brother is also into sports like me. And he likes to dance so I get him a lot of Justin Bieber” [Justin Bieber songs, Justin Bieber videos]. I bond with him by bringing him to my triathlon trainings plus I go with him in his swimming lessons. I motivate my brother because back then when I was young my parents used to do the same,” Matteo shared. 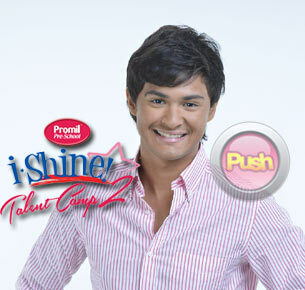 Just like Matteo’s parents, support your child and hone his talents by joining Promil Pre-school I-Shine Talent Camp 2 (for children above 3 to 7 years old). Your child can showcase his talents and gain confidence by interacting with other talented kids. Simply purchase a minimum of PHP250 worth of Promil Pre-school pack size (180g, 900g, 1.6Kg pack) from April 1 to May 19, 2013. To join, parent/s or guardian, together with his/her child, must go to the I-Shine event on the following dates and venues: SM City San Pablo, Laguna – April 20, 2013, SM Rosales, Pangasinan – April 27, 2013, SM MOA, Pasay - May 1, 2013, Abreeza, Davao City - May 4, 2013 and Ayala Center, Cebu City - May 12, 2013. Aside from auditions, the mall events will also hold FREE Star Magic Workshops in voice, dancing and acting and other fun activities. You can also record a three-minute video (MPEG, MP4, WMV, AVI or MOV video file format) of your child showcasing a talent in singing, acting or dancing and send or mail the video with a valid proof of purchase to either of the following addresses: ABS-CBN Sgt. Esguerra Ave, cor. Mother Ignacia St, Quezon City, 1103, Wyeth Nutrition P.O. box no. 1207. Submission of entries is from April 1 to May 19, 2013. Over PHP 1 million pesos worth of prizes, plus talent contracts from Star Magic and Promil Pre-School will be given away! Let your child’s talent shine at Promil Pre-School i-Shine Talent Camp 2!